This is part two of last week's interview with Robert Porter. And I'm happy to say that since that posted, Robert won the Devour Bartending Competition that took place on January 28th and came home with the trophy and title of Arizona’s Star Bartender in 2016. Congratulations! To experience his expertly-crafted libations and award-winning skills, stop in at the Thirsty Camel Lounge at The Phoenician Resort. I had a chance to spend some time with Robert as he demonstrated two of the signature cocktails on the menu, along with one of his own creations. We start with the Double Barrel. "This is made with our own line of Herradura tequila exclusive to the Phoenician," he informs me. "This is a tequila that has been aged for one year in a used charred bourbon barrel and then aged for another 30 days in a new charred oak barrel, so it’s double wood. It gives a nice, soft finish and a bit of smokiness to it. Next, I add a half ounce of Cointreau, a half ounce of sweet vermouth, and 3 dashes of Angostura bitters. Then give it a nice stir, and finish with an orange twist." "It's basically a double barrel-aged tequila Manhattan," Robert describes, "a nice savory drink. Myself, as a whiskey drinker, Old Fashioned or Manhattan drinker, this kind of goes along with that. People visit and associate Phoenix with the desert, the southwest, tequila. Tequila just incorporates a little more of what Arizona is about. It’s a modern take on an old-school drink." Beverage Director Jared Sowinski explains more about the custom spirits exclusive to the property. "For this Herradura Reposado, I got to sample five barrel styles. I chose something even non-tequila drinkers would like so I didn’t go too heavy on the green herbaceous flavors of the agave. Something a little softer that you could pour on the rocks or drink neat and also mix and have fun with. When I got it, I came to Robert and said let's make a cocktail, and together we came up with the Double Barrel." "We also have a single barrel, private label Paradiso from El Tesoro. It's an extra añejo aged five years in used bourbon barrels and an additional three in used cognac barrels. Totally different style, totally different price point than the Herrardura. We wanted something like this because of the age and the flavor profile." "We have a phenomenal relationship with Woodford Reserve also and did a personal selection. I went to the distillery and that's a process where we get to taste from barrels, pick two favorites, and the master distiller blends them together to create the style. I wanted something approachable so I picked one barrel that was really spicy and one that was softer and sweeter. This has been so successful that we are now on barrel number five. We also partner with them for our annual Kentucky Derby Party." For round two, Robert introduces a cocktail creation he calls the Solar Eclipse. "It features basil and fresh ginger root, an ounce of lemon juice, a little simple syrup, a half ounce of Cointreau, three-quarters of an ounce of cranberry juice and my favorite gin, Nolet’s." "I like to use a tea strainer. It strains out all those bits of basil leaves and ginger, or any kind of herb or berries I might use." "This is the kind of a drink I do for private parties. It’s about balance with your sugar and acid and then you can add savory things like basil and ginger." Drink three is appropriately named The Last Cocktail. "With Starwood, The Phoenician is part of the Luxury Collection and every property in the Collection has their own signature cocktail and will offer this drink," he tells me. "It’s a lot of fun. It’s a spin on a French 75. What I love about it is it has an extra spice component to it with ground cloves that go on top so it has great aromatics and a nice pop. This has pear puree, lemon juice, and a rosemary-infused agave. The spirit is going to be Bombay Sapphire. We’re going to shake this one up and finish it with prosecco and a bit of ground clove." "I think anybody who tries this is going to love it. It’s a great combination. The lemon and sparkling wine keeps it from being too sugary. With the bubbles it’s a great palate cleanser or paired with seafood or anything with a buttery or oily texture. The aromatics are fantastic. You bring it to your nose and get a great whiff of rosemary and clove." You can also learn from this talented artist at the Grape and Grain shop in the main lobby on Saturdays. 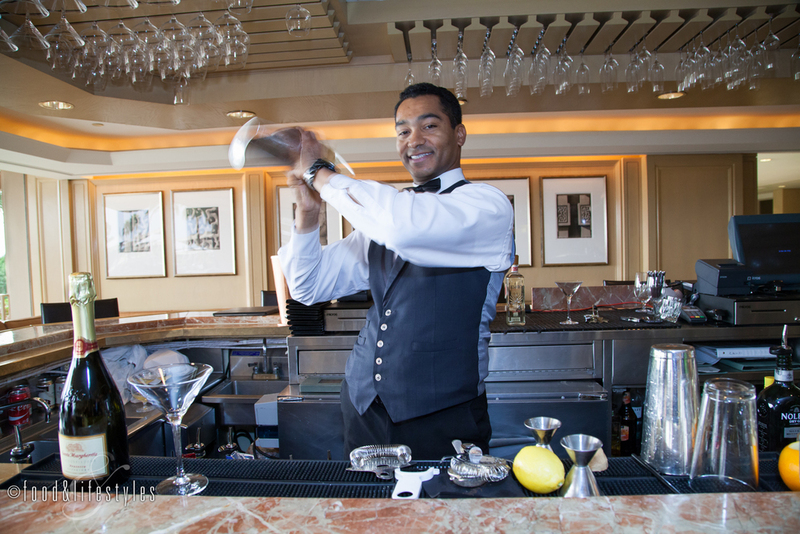 From 3-4 pm every weekend, you'll find Robert mixing up one of the featured cocktails in an educational class with samplings. Of course, you can always pull up a stool at the Thirsty Camel. 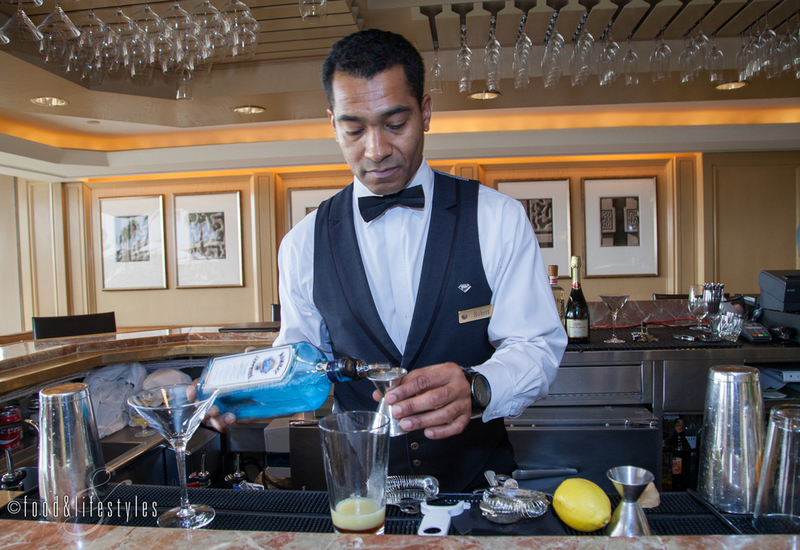 "There’s something about being behind the bar that lets me be more of myself," he muses. "I can be more open, more laid-back, more fun, and try to draw people out of their shell, and people expect that when they go to a bar. I’m a big talker, so being a bartender is great. I just like being behind the bar and creating drinks. We’re entertainers. We teach people. It’s a fun field to be in."